Finding the food to feed from 20 to 40 campaigners for two months can be a bit daunting after one’s main grocery store burns down. We began scavenging about 3 months before their arrival… especially for meat. As the propane gas shortage prevented us from using our freezer, the meat had to be “on the hoof” for the most part. 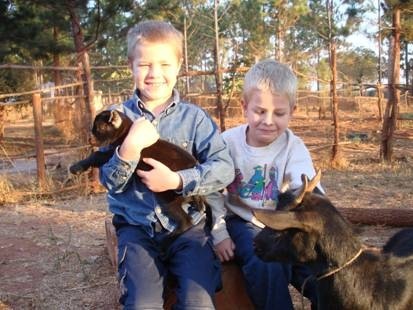 Noah and Bryson usually take on the livestock as their personal project. 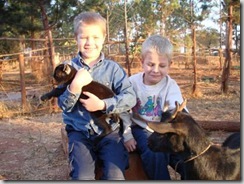 As they are taking on a “farming” ethic, this year they decided to name two of the goats “Lunch” and “Supper”. While preparing to slaughter Supper, the boys discovered that she was pregnant and thus granted her a stay of execution. They had to serve Lunch for supper that night, but our campaigners didn’t notice the discrepancy. Last Sunday, Supper had her baby, a little black and white male, and the boys decided to name it after a delicacy that the campaigners had brought with them for desert… Oreo.